It’s that time of year and we’re once again getting ready for the annual Open Studios Weekend at the Courtyard Studios. Brian Craig, the current studio rep and resident graphics expert, has just put together the event poster and invitation and so here it is. Looks good and there should be a really interesting selection of work to see at the weekend. Twelve artists will be taking part including three new tenants at the Courtyard; painters Michelle Muir and Ethan Foy and award winning hand book-binder Tom McEwan. Other artists include, painters Chick McGeehan, Margaret Carslaw, David Reid, Stewart Souter, Alison Thomas and me. Away from painting, you will see ceramics by Nita Groves, photography by Brian Craig and jewellery by Ayrshire’s Business Woman of the Year, Sheila Kerr. We have a new tenant who is in the process of moving in, but other than that she’s a painter, I’m afraid I know nothing else, not even her name or whether she’ll be in her studio on the weekend …so there may just be thirteen artists and some new work for all of us to see. Full details of the event are on the Invitation below. 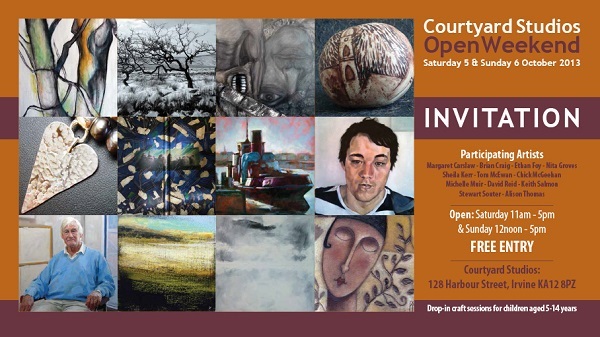 I do hope you can get along to the Courtyard Studios that weekend, but if not, remember that visitors are always welcome. There’s a good variety of food and refreshments available within a short walk of the studios including The Ship Inn, the Harbour Arts Centre bar and café and the very traditional café / tea shop – Small talk…..so something for most tastes. Hope to see you on Saturday 5th or Sunday 6th October.